Small and midsized companies in today’s complex business environment have excellent tools for running their businesses – both modern accounting software and ERP systems provide a unified view of your data that exceeds capabilities from just a decade ago. 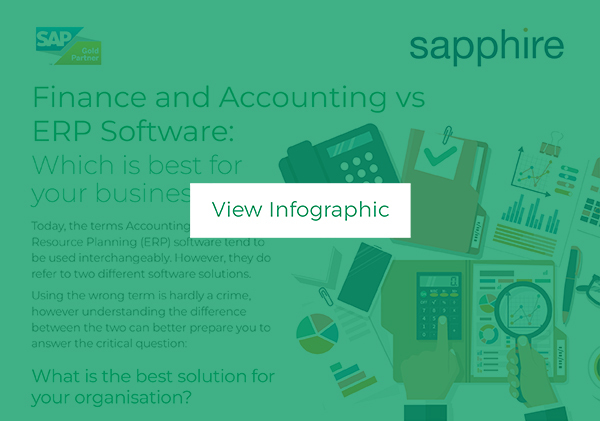 This blog discusses the capabilities of accounting software and ERP systems, highlighting the unique benefits of each and noting how they’re different. If you haven’t reviewed accounting software recently, you’d assume it covers the basics (but only the basics) for accounting transactions like payroll, accounts receivable, accounts payable, and trial balances. You’d also expect add-on modules for billing, sales orders, purchase orders, general ledger, timesheets, expenses, and electronic payment. And you’d be right – but today’s accounting software does much more. It offers visibility across complex business operations with a unified view of all financial data. In addition, today’s leading accounting software reflects the understanding that financial accounting processes underpin operations and drive business decisions, particularly in complex businesses that operate internationally. New capabilities also include multi-currency, multi-company, and multi-dimensional analysis as well as integration with other company systems and software. These advanced capabilities make the software ideal for project-based, partner-based, and complex industries like energy, financial, and professional services. Now, users can easily track and account for joint venture agreements, allocate costs for joint billing, maintain multiple reporting structures, simultaneously report in multiple currencies, and more. Given the areas of information unified in today’s financial and accounting software, companies are also relying on it to forecast potential scenarios and predict and manage business growth. Just as financial and accounting software has progressed rapidly, so too has ERP software. The financials are still there, as are the resource management capabilities for tracking tangible and intangible assets, human resources, materials, and financial resources. Now, however, ERP systems can also track and run business operations across the entire enterprise, serving as the process and workflow hub for everything from supply chain management, customer relationship management, service management, stock and distribution control, and production control to in-market product tracking. If you can think of a function that’s core to your business, modern ERP systems either have the functionality or can integrate it with an add-on module. The purview of ERP has shifted; while you can use it strictly for financial needs, it would be a waste of software that can perform financial analysis that factor in the findings of information from product lifecycles, customer relations, real-time eCommerce, and more. With the wide array of business software in the market today, the distinction between the various types has been blurred, especially between Financial/Accounting and ERP software. Many use these two terms interchangeably, but, technically, they are different. View our infographic to get a better understanding of the differences, and which may be right for your business. The progress made in both financial and accounting software and ERP software has been impressive in the last decade – so much so that the cost of doing business without one of them can be extreme. The fact is, virtually all leading companies in every industry rely on modern accounting software and/or modern ERP software to gauge, report on, and improve business operations. To discover which type of software modernisation can propel your business forward, contact Sapphire. Still unsure? Join us at our latest Software Selection and Implementation masterclass where we will dig deeper into financial and accounting software and ERP systems to help you determine which is best suited for your business. Register today.